Mike Garlick and John Banaszkiewicz have been elected joint-chairmen of Championship side Burnley. They replace Barry Kilby, who is standing down after 13 years at the helm because of ill health. The Lancashire-born pair, who had previously served as directors, will head a five-man board, which remains unchanged after a meeting on Friday. Having relinquished his chairman's role after being diagnosed with cancer in February, Kilby remains a director. Garlick told the club website: "On this occasion, I believe that one plus one equals three. "There is a greater synergy through two people combining their resources in terms of brainpower, knowledge and financial support. "We aim to make the club stronger and give us a better chance of success in the future." 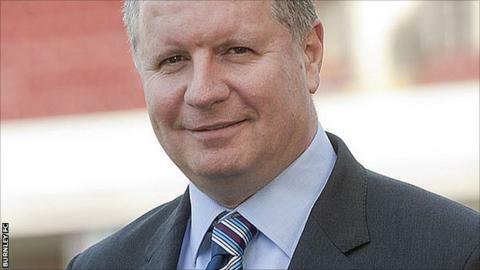 Banaszkiewicz added: "I am honoured to have been elected as co-chairman of Burnley. "I am committed to working with Mike to continue the progress the board has made and bring success to the club in future. "We are one of the league's oldest clubs and I believe together we can strike a balance between supporting our local community and building Burnley as a global brand."